Individuals led the way into nearly all forms of digital and social media, from email to YouTube, Twitter to Facebook, SecondLife to LinkedIn. What was once an expression of each user’s individuality is evolving as businesses have realized the power of digital and social media to shape opinions, build brand awareness and deliver real bottom-line results. So it was inevitable that the question of compliance and ownership of social media would become an issue as more and more people began using their expertise, contacts, and networks as part of their career – not simply their personal life. Regulators in some industries, such as financial services, have said that there is no difference between personal and professional use of the Web. That has all sorts of implications that will affect nearly every business and professional. This webinar offers insights and tools for any business that needs to balance the need to comply with regulations and the need to empower employees and create a work environment that attracts and keeps the best talent. The question still exists of how can financial services firms can effectively and compliantly integrate social media to support business goals. This webinar will tackle that issue with Steve Holstein, CMO of Guardian, discussing his organization's social business process and lessons learned from providing social media tools to the field. Based on working with early adoption programs, Chad Bockius of Socialware will then breakdown a framework for how to build a plan that delivers business results. You'll walk away equipped to lead a strategy conversation with your internal stakeholders. Join Chad Bockius, Steve Durkee, and other Socialware staff as we discuss what we learned at the LIMRA Distribution Conference and how to change “the game” for the life insurance industry by using social media to grow business. LinkedIn, the world’s largest professional social network, is a powerful business tool for relationship-driven industries such as financial services. But many people just don’t know where to start. During this four-part webcast series, experts from LinkedIn, Socialware, and Ajax Social Media will share tips and best practices for how you can get the most out of LinkedIn. In Step 4, the 30-minute discussion will focus on how to share content and post comments that demonstrate not only your professional core competencies but also your own personality. We will also address compliance considerations and real-life user examples. LinkedIn, the world’s largest professional social network, is a powerful business tool for relationship-driven industries such as financial services. But many people just don’t know where to start. During this four-part webcast series, experts from LinkedIn, Socialware, and Ajax Social Media will share tips and best practices for how you can get the most out of LinkedIn. In Step 3, the 30-minute discussion will focus on how to listen to what your connections are saying and how to identify money-in-motion events such as job changes. We will also address compliance considerations and real-life user examples. LinkedIn, the world’s largest professional social network, is a powerful business tool for relationship-driven industries such as financial services. But many people just don’t know where to start. During this four-part webcast series, experts from LinkedIn, Socialware, and Ajax Social Media will share tips and best practices for how you can get the most out of LinkedIn. In Step 2, the 30-minute discussion will focus on how to build quality connections that correspond to your target audience and what tools are available within LinkedIn to find them. We will also address compliance considerations and real-life user examples. LinkedIn, the world’s largest professional social network, is a powerful business tool for relationship-driven industries such as financial services. But many people just don’t know where to start. During this four-part webcast series, experts from LinkedIn, Socialware, and Ajax Social Media will share tips and best practices for how you can get the most out of LinkedIn. In Step 1, the 30-minute discussion will focus on the necessary ingredients for presenting yourself and your unique value proposition effectively in your profile. We will also address compliance considerations and real-life user examples. 2011 was a very busy year for social media in the financial services industry. The pace promises to continue throughout 2012. Firms in insurance, wealth management, asset management, broker dealers, and more are leveraging the business opportunities of social media while also ensuring usage is compliant and effective. Attend this webinar to learn key predictions for what to expect from the industry in 2012 including technology, business results, and additional insights into the continuing growth of social media in the financial services industry. 2011 has been an eventful year for social media across the financial services industry. Here are just a few of the highlights... New regulatory guidance including FINRA Regulatory Notice 11-39, firms across the industry announcing their move from prohibition to participation and even engagement, advisor statistics continually showing the interest to use social media in driving business, and more. Attend this webinar to learn how far things have progressed in just 12 months. Presenters are Chad Bockius, Socialware CEO and Bob Hansmann, Blue Coat Sr. Security Technology Evangelist, Americas. Social media use continues to grow rapidly among financial services professionals. The second largest segment on LinkedIn is financial services. 2011 industry data shows that nearly 50% more financial advisors are using social networks for business purposes than were in 2010. Financial services is a relationship driven industry which makes it ideally suited for social networking. While there are many advantages of social media, there are also challenges including compliance, security, and performance impact. These challenges require education, training, and technology. Understanding and overcoming the risks of security issues like malware are crucial to safe and effective social media use. View this joint webinar between Socialware and Blue Coat, leaders in social business software for financial services and Web security and WAN optimization solutions for a discussion covering the key issues and practical solutions for unlocking the potential of social media without the exposing your firm to unnecessary risks. Why are you using digital & social media programs? What regulations and brand standards must be applied? Where do your prospects/customers look for information? When is your company/brand being discussed online? Most advisors know that LinkedIn is the premier networking tool, but they do not realize there are many more powerful benefits to using it effectively. Mike Byrnes & Chad Bockius will show how advisors can use LinkedIn in their marketing and business development strategies to save money, communicate better, increase referrals and gain new business. This webinar will focus on the optimization stage of the Social Media Life Cycle and examine strategies and best practices for optimizing the adoption of social media, stakeholders, and compliance considerations when optimizing. This webinar will focus on the activation stage of the Social Media Life Cycle and examine strategy, integrations, and processes for adoption. Additionally we will cover IT, infrastructure, distribution and compliance considerations. This webinar will focus on the training stage of the Social Media Life Cycle and examine processes and documentation for adoption. Additionally we will examine training, field best practices and regulatory considerations. This webinar will focus on the procedure stage of the Social Media Life Cycle and examine processes, documentation, and tactics for adoption. Additionally we will examine stakeholders involved, and important procedural considerations, such as adhering to regulations. The webinar will focus on the policy stage of the Social Media Life Cycle and examine characteristics of policies, the stake holders involved, and important considerations when developing and adopting a policy, such as the ROI for the business and costs associated. This webinar examines best practices for driving business and connecting with customers using Facebook, keeping in mind the compliance challenges associated with using this site. Learn innovative strategies to Re-Connect, Discover Insights, Distinguish yourself, and Make Fans & Friends through Facebook. Ultimately driving new business and deeper relationships with your customers. Learn how advisors can use Twitter to supercharge their Research, Communication, and Brand Building. Hear tangible best practices for how Advisors can get started and incrementally add sophisticated techniques to gather insights, enlighten followers, and ultimately become a destination. 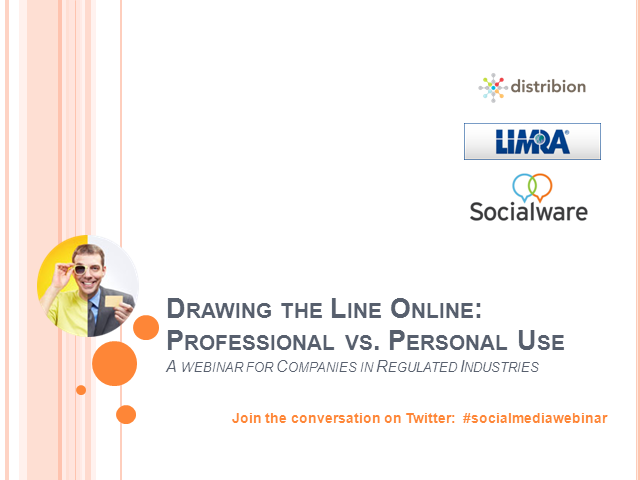 Join Socialware and LIMRA for a discussion on the pattern of adoption of social media by financial services firms. Learn about the critical stages of adoption, how to move from one stage to another and the risks associated each step along the way. Get answers to all of your questions around adopting social media in regulated industries.